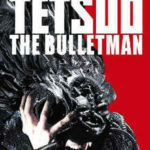 The Film- A meteor that crash lands in Tokyo Bay has unexpected effects on the atmosphere, releasing a cloud of cosmo-amphetamine that quickly turns the population into shambling zombies. To makes matters worse, the military seems to only want survivors to come to them, and will not leave their base. The General’s daughter, K-Ko, begins a secret recovery mission to find refugees. Instructed by videotapes left by her father, she ends up in the party of a group of punks who deliver weapons in an armored bus (going under the name Battle Kids). After abandoning them at a secret base, she finds a present her father left for her- a custom suit of Battle Armor! Now, Battle Armor is not some kevlar flank jacket-ish thing. It’s a leather and metal bodysuit that comes with an Uzi, wrist mounted laser sights, a visor that gives you “T-1000 vision”, and several other little hidden surprises. With her new threads, K-Ko visits the military base where her father works, only to find it under the control of General Hugioka. Hugioka informs K-Ko that her father went MIA three days prior, but his story is a little odd- epically considering he has a squad of armored misfits as bodyguards (which he calls Hunters). After some snooping, K-Ko realizes the military plans to cover the entire outbreak up, and are exterminating the survivors they don’t plan to experiment on. She flees to find her father and aid his rescue mission, but the Hunters (who are actually crypto-amphetamine injected super solders ordered to kill the remaining humans) follow close behind. After meeting up with the Battle Kids again, K-Ko and the arms dealers make a desperate fight to escape the zombie infested Tokyo Bay! This movie feels just like a throwback to Japanese zombie films. 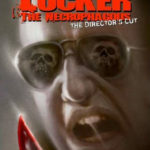 The newer movies like Tokyo Zombie and Stacy have a satirical vibe to them that was nowhere to be seen originally. 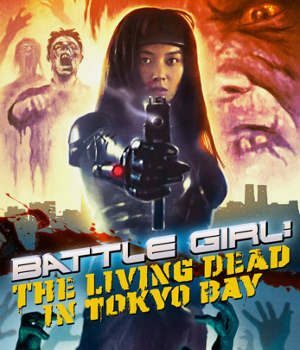 Battle Girl is a low budget budget sci-fi transgression right back to the forefront of films like Junk and Versus, which are a dying genre (did you ever think you would hear someone say “the world needs more Classic Japanese Zombie Films”?). The suit is one of the coolest, cheesiest things I have seen in a while. It’s totally bulletproof, lopsided as hell, and has a shotgun and knife built into the boot (ala Jim West). Asides from the aforementioned Junk, Battle Girl also draws from the likes of Re-Animator and Hell of the Living Dead. All of those films merged into one, with something as ridiculous as the Battle Suit, ensures one hell of an entertaining movie. 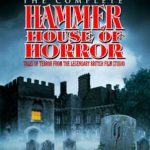 If you like zombie, sci-fi, action, or just plain wacky movies, then you’re going to have a great time. Even though it has obvious references to well known films, it does it in a non parody way. The humor is unique and goofy, and the effects are well done. Battle Girl has something to offer almost everyone. The Package- Aside from a mild bit of static, Battle Girl has a nice transfer. There’s no major print damage or any kind of visual hiccups present. The colors and contrast are good, and the dark scenes (which are plentiful) don’t have any major defects like pixelation or heavy static. 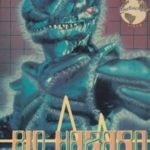 For the audio Synapse has included the original Japanese track with some good, but flawed subs. There’s no grammatical errors or typos, but some of the translations are just plain dumb. The funny thing is you really can’t tell if it’s the language gap or if the script its self. These lines add to that hokey feel I was talking about, and most of them are stupidly humorous. The only supplement is an interview with director Komizu. It’s an hour long featurette that consist of Komizu sitting around and smoking while answering questions about the film. It’s thorough and interesting, but in some places it can really drag. I would have liked to see more, but this interview is still a great extra.